It’s crucial to know how to talk about ONE’s work and the opportunity in the fight against extreme poverty. Here are some basic guidelines on how to message ONE as an organization, our policy priorities and key stats. Our voices have power. Direct, personalized communication directed toward elected leaders is one of the most impactful ways to influence the decision-making process. ONE calls these types of advocacy actions “catalytic actions,” and includes handwritten letters, phone cals, in-person meetings, tweets, or any other personalized communication that is directly addressed/delivered to a decision maker asking them to support one of ONE’s policy priorities to help end extreme poverty. 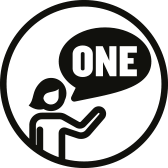 ONE is an international campaigning and advocacy organization made up of more than 9 million members taking action to end extreme poverty and preventable disease, particularly in Africa. Extreme poverty has been cut by 2/3 since 1990. The numbers show that we can virtually eliminate extreme poverty by 2030. 17 million people now have access to lifesaving HIV/AIDS medicine, up from just under 700,000 in 2000. An estimated 60 million more children in sub-Saharan Africa were enrolled in primary school in 2013 than in 2000. To learn more download the full PDF!